We spend lots of time planning these pieces, and I want to make your art worth every bit of your time! I was looking to have a custom family crest made. I came across Flourish Family Crests while searching the internet. I reached out and got a quick response from Jamie. I sent her a concept drawing of what I was wanting to do. My project was unique in scope and scale. 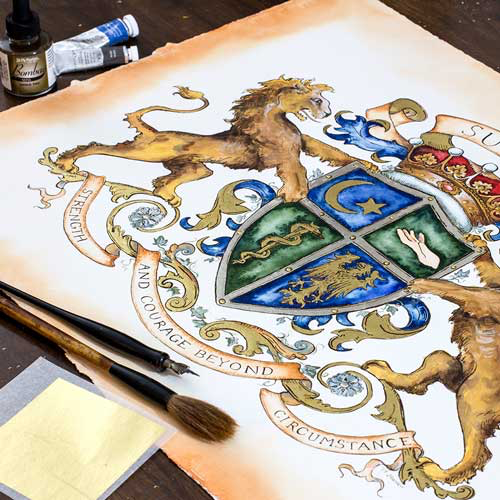 It included multiple crests (one for the entire family and one for each of my kids) and was roughly 2 feet tall by 3 feet wide (the largest family crest project she has done to date). This created some challenges but Jamie handled them with no problem. Jamie kept in touch with me throughout the design process sending me multiple proofs along the way giving me the opportunity to provide feedback regarding; colors, layout, design, etc. I placed the order in the spring with the plan for the crest being a Christmas present. Jamie had the crest done way ahead of schedule even with the different challenges this project faced. Although I knew generally what my crest was going to look like from the pictures Jamie had sent me, nothing could prepare me for the actual work of art. I was speechless when I pulled it out of the box. It was so amazing that I couldn't wait until Christmas to give it to my family but had to have a presentation ceremony that next evening (a piece of art of that magnitude is not just given but unveiled). I can't express what a pleasure it was to work with Jamie. Her work is fabulous and her customer service is such that I would now consider her a friend not just a business contact. On a scale of one to awesome, Flourish Family Crests and Jamie get an AWESOME hands down.